We spent our wedding anniversary exploring the stunning gardens of Anglesey Abbey… which was peaceful. 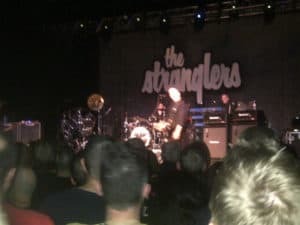 Then we went to a Stranglers concert… which was loud. I might be showing my age here, but I couldn’t remember when I’d last spent a Saturday night hopping in a mosh pit! The guys were very good, though, playing a two hour set with only a tiny break towards the end. And no skimping on the delivery, either. It was loud and fast and energetic from the moment they stepped on stage. And it wasn’t just the kids in the centre of the mosh pit who were hopping. So…it was more fun than I thought it’d be despite the hefty dose of decibels that assured that I could feel the music but not always hear it! I even learned a new word… crowdsurfing. And, watching the mosh pit crowd from up close, the Muse then came up with a decorative and very appropriate finale for my rock star romance. And some more lyrics. That’s the drawback, sometimes. The Muse will not be left meekly at home when we go out. She needs to come along and busy herself with something. But, as they tell you in writing class, it’s all grist for the mill.